Hi and welcome to this introduction to the most powerful tool in Black Ink: the Controllers. First of all, what are they exactly ? Controllers are a simple visual language used to customize your brushes. They are used to assign behaviors to brush parameters like for example, link the size of a brush to your tablet's pressure. You can use them for simple tweaks to fine-tune your perfect drawing brush or go further and create a wide range of unique effects. You can also go to the window menu and use the controller editor toggle. Default shortcut is "c". On the left side are folders containing different behaviors for us to use. The center is the work area where everything happens and on the right is a list of all the parameters of the current brush that can be modified with controllers. Let's start with the size. We can see there are already a few controller blocks plugged in. The most important one is the first. It's the pressure you apply to the stylus of your tablet. the next two are used to make the input a little more dynamic and smooth but we'll talk about these functions in more in-depth tutorials. Having the size modified by pen pressure seems like a good basic behavior so let's leave it as it is and move to the opacity parameter. There you can see a little more complicated setup. We will not discuss the details right now but what this setup does is inverting the speed input from your tablet. 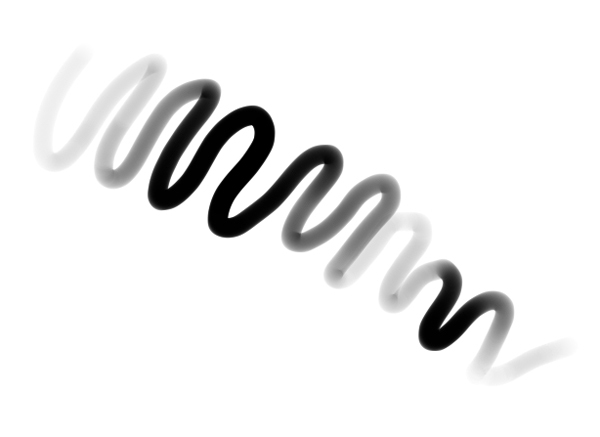 This makes the brush more transparent when you draw faster, like a felt pen. Now let's delete that and plug a block of our own ! Click on the bin icon of the last bloc on the right (sub). This will delete this block and all the blocks connected as inputs. Don't worry, you can't save over built-in brushes so feel free to experiment with the controllers. You can always get the original brush back with the brush history or restart Black Ink. Now that you have a clean work space, go on the left site of the window and open the "Stroke Parameters" section. Then, just drag&drop a pressure block into the work area. For the controller to take effect, it will have to be connected to the output arrow next to the parameters list. It won't do anything if let alone in the work space without any connection to the final output. When the two arrows are close together they become highlighted and when you release, the block snaps into position. A size from 10 to 15 should be nice. It will be 10 when you don't press, and 15 when you apply more pressure to your stylus. And that's it, our brush now gets more opaque when we press on the stylus ! That's pretty much all there is to know to begin with brush customization, making a parameter follow the pen pressure or its speed is as simple as that. Try with different parameters ! As we have seen in the first steps tutorial, brush parameters have a minimum value and a maximum value you can set in the extended slider. What controllers do is feed the parameter with a value between 0 and 1. 0 will be the minimum value of your slider, and 1 the maximum. They simply are the rule that tells the parameter how and when to change within the range you set. Now you can experiment with parameters and block and have fun with brushes! To read more advanced tutorials dedicated to the controllers or if you have any question about them, please visit our Brush Making forum.